WHAT: The University of Illinois Springfield will officially open the new $21.75 million Student Union Building during a ribbon cutting ceremony. 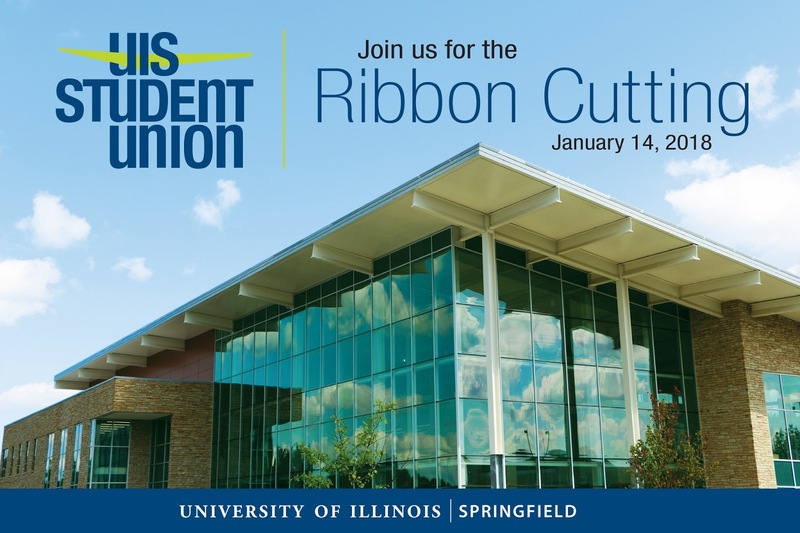 UIS Chancellor Susan Koch will be joined by U of I President Timothy Killeen, Springfield Mayor Jim Langfelder and student leadership to cut the ribbon. WHEN: Sunday, January 14, 2018, at 2 p.m. An open house will immediately follow the ribbon cutting until 4 p.m. DETAILS: The two-story, 50,000-square-foot student union anchors the campus’s south quad, providing campus dining services, a Starbucks coffee shop, a ballroom with seating for up to 450 people and a Student Leadership Center that houses student government, volunteer offices and workspaces for student organizations. The first-ever student union will serve as a social hub for student life and foster a greater sense of community on the growing campus. In this signature building, so full of light and activity, students will interact with each other and with faculty, staff, and visitors, creating a vibrant and thriving focal point for life at UIS.